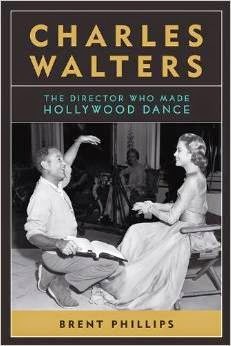 I've been looking forward to Brent Phillips' biography of director-choreographer Charles Walters for some time now, and the recently published CHARLES WALTERS: THE DIRECTOR WHO MADE HOLLYWOOD DANCE did not disappoint. This 368-page book, published by the University of Kentucky Press, is meticulously and thoroughly researched, covering "Chuck's" life from his childhood in Anaheim, California, to his success on Broadway and in Hollywood, then closing with an account of his teaching experiences at the University of Southern California prior to his death in 1982. As I've written in the past, I sat in on a couple of Chuck Walters' classes at USC and had the chance to meet him; he was a very nice man. 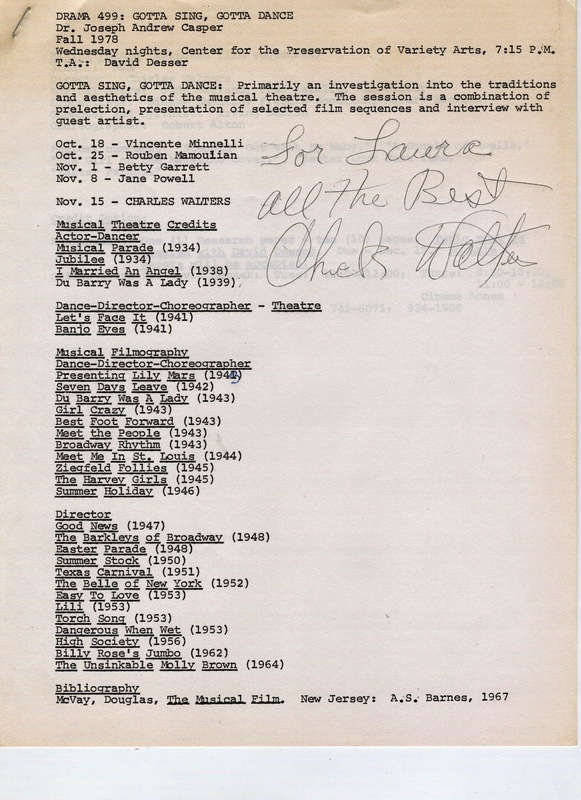 (The signed class syllabus and autographed photos seen here are from my personal collection.) My good feelings toward Walters and my love for a great many of his films made reading this detailed life history a pleasure. 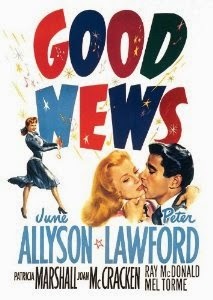 Walters began his Hollywood career as dance director on MGM musicals such as MEET ME IN ST. LOUIS (1944); he then became a feature film director with the effervescent GOOD NEWS (1947). 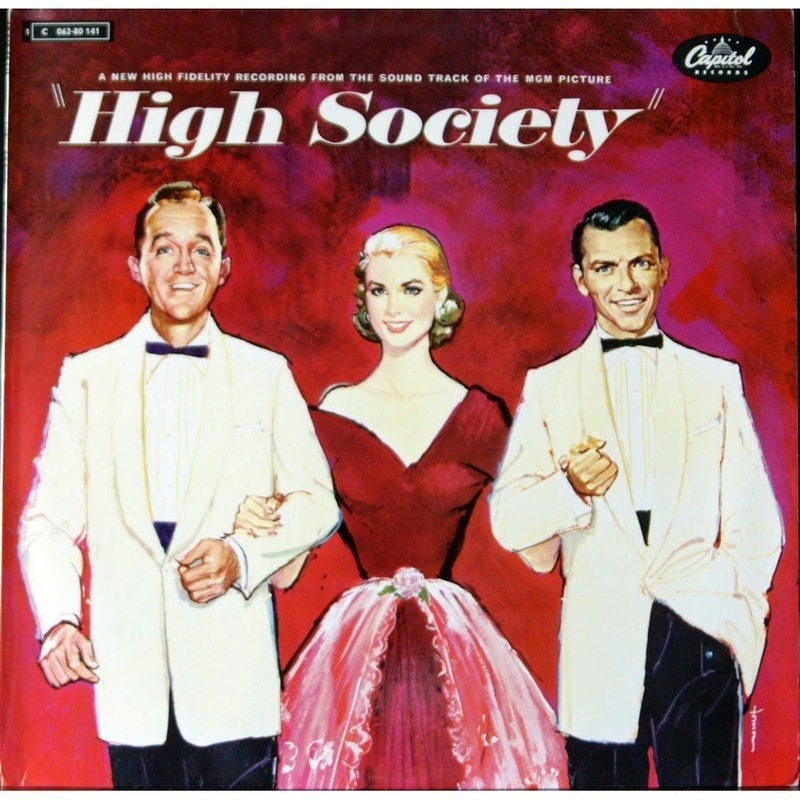 Walters' MGM musicals also included wonderful films such as EASTER PARADE (1948), SUMMER STOCK (1950), LILI (1953), EASY TO LOVE (1953), THE GLASS SLIPPER (1955), and HIGH SOCIETY (1956). He retired from directing after making WALK DON'T RUN (1966) with Cary Grant. Although Chuck Walters has been gone for over 30 years, the author was nonetheless able to tell much of the story in Chuck's own words, thanks to old interviews. Phillips also used primary source documentation such as Walters' birth certificate and MGM interoffice memos, and he consulted a variety of contemporaneous news reports. Some of the material in the book came from the Charles Walters and Arthur Freed collections at USC. I mention the breadth of research in part because I thought the author did a terrific job pulling together information from such a variety of sources into a book which is both highly readable and exhaustively footnoted. I noticed the value of the author's careful research right off the bat -- IMDb records that Chuck was born in Brooklyn, but Phillips traces his birth to 325 South Grand Avenue in Pasadena. I was fascinated to learn he'd grown up in neighboring Anaheim, where he graduated from Anaheim High School. My favorite chapters were the detailed looks at the creation of his MGM musicals. Phillips used a wealth of comments from MGM stars and minor players, mixing his own first-person discussions with recorded interviews with stars who are no longer with us. I especially loved reading quotes from relatively obscure performers such as MGM dancer Caren Marsh. These quotes consistently reveal a director who was upbeat, collaborative, and able to physically demonstrate to his cast members what he wanted to see on the screen. Side note: If only Walters' personal choice for the lead in ANNIE GET YOUR GUN, Betty Grable, had been signed for it by MGM! What a movie that could have been, directed by Walters. As it happened, Walters didn't even make the movie, as it was "stolen" by director George Sidney, who had greater clout with the studio brass; with Betty Hutton in the lead I find it unwatchable. One interesting tidbit among many: in the '30s Walters made his initial attempts to break into Hollywood alongside another unknown who became a good friend, Tyrone Power. One of my few unanswered questions after reading the book: did Walters and Power remain lifelong friends? The book includes 32 pages of well-chosen photographs printed on flat (non-glossy) paper. For more on this book, please visit Raquel's review at Out of the Past, as she brings out additional points of interest on the book. There was also recently a review by Ethan Mordden in the Wall Street Journal -- I loved his comments on "Under the Bamboo Tree" in MEET ME IN ST. LOUIS -- and there's a nice piece on the book and author Brent Phillips posted by Eileen Reynolds at New York University, where Phillips works. CHARLES WALTERS: THE DIRECTOR WHO MADE HOLLYWOOD DANCE is a top biography which receives my very highest recommendation. Sincere thanks to the University of Kentucky Press for providing a review copy of this book. Thanks for your review. Must get it. Excellent review! I have been wanting to read this book for awhile- I think your review just tipped me over the edge. I must own it immediately!